Two main productions each year, a pantomime or family show in February and the theatre suppers in the autumn. Smaller events also arranged such as ‘With great pleasure’ and ‘from the cradle to the grave’ which include readings, poetry and music. The group also arranges play reading evenings for members where along with a supper, there is the opportunity to read through scripts, either just for fun, or to help with chosing a play. If you like Theatre, you will love this beautifully performed, funny, diverting and thoroughly archetypical example of Coward in full swing. It would be a shame if it were confined to a handful of performances in one village and I was relieved to see that it will tour Cornwall in March and April next year. 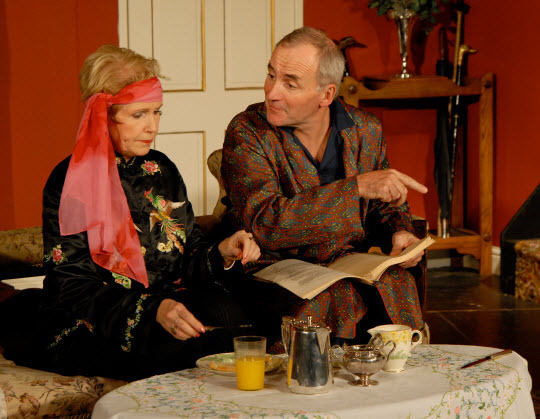 The play is set in a country house Cookham, Surrey during 1925. The rather eccentric Bliss family are due to entertain a number of week-end guests and this provides the vehicle for Coward’s hallmark one-liners. During his formative years he was introduced into Society and obviously used the wonderful material he found there to parody its antics and behaviour to the great entertainment of a much wider audience. For example, some of the lovely one liners are attributed to Mrs. Astley-Cooper, an eccentric society hostess of the 1920’s and grand-daughter-in law of the famous surgeon buried in St. Pauls. According to accounts, she would spend much time in company lying in front of the fireplace uttering pithy witticisms. But whatever the origin, the lines are just brilliantly delivered by Glenda Ellis who plays Judith Bliss, undoubtedly the star of an extremely talented cast. She is terrific. The family, mother, father, and two spoiled young adult children spend their time scoring off each other at the expense of their poor guests. There is farce and romance interwoven throughout and it is just plain funny! I loved it from the beautiful period piece set and incidental music, through the delightful costumes to the excellent performances delivered by whole cast. Along the way we learned a new party wordgame using adverbs, which will come in very useful for the coming festive season. Sorel Bliss played by Ann-Marie Fox was beautiful and fluent and her brother was nicely played by Barnaby Lanyon-Jones. Performances and audiences, like old violins, need to be warmed up to reach their best and these two got us going nicely. I have not seen Ruth James doing ‘Dowdy Yorkshire’ before and have to say that as the taciturn house-keeper she has redefined her talents. Steve Jefferies loves his paternal roles and was excellent as David Bliss, the father and novelist who has invited down the pretty but hopelessly out-of-her-depth Miss Coryton, a ‘flapper’, for the purposes of ‘Psychological study’. Dr. Jane Gilbert does not, I trust, flap in practice as well as she flaps on stage. Lisa Townsend has taken time off from her family rock band and was spot-on as the hard-hearted, sexual predator of the piece. Hugh Parker’s attempts to strike a pose at the piano was absolutely hilarious and David Kinnair dog-like in his devotion to Mrs. Bliss. Steve Jefferies and the Company have been around these parts for several decades and are now attracting amateur talent of the highest order. We are so lucky to have them available for our stimulation and entertainment. See them if and when you possibly can. 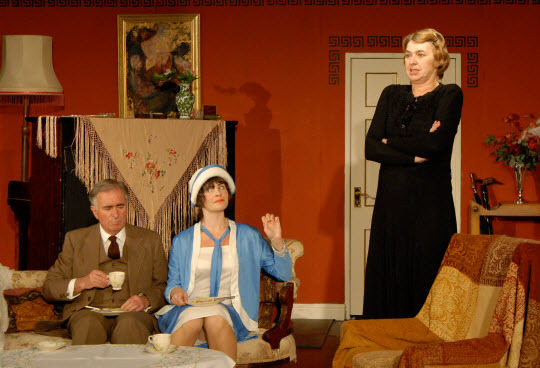 "The classic J B Priestley comedy will complete a successful autumn run with performances at the very eastern and western ends of Cornwall this week. Smug in their successful lives, the men bluster over port and cigars while their wives perch on the sofa like three contented hens, at ease with life and their elevated status. Nothing could possibly alter their blissful situation. Or could it?Right from the word go the characters are quickly defined, a sign of a great cast well into their stride, and Chloe Carrubba starts the comic ball rolling with a sparkling performance as the maid Ruby, bemused by the chaos that ensues when the local organist, played by Barnaby Lanyon-Jones, in fine languid form, reveals that the marital bliss enjoyed by the three couples may be a sham as the vicar who married them wasn't licensed to do so.Staged by Menheniot-based Camp Theatre, When We Are Married takes place in a neat, Edwardian parlour where three couples are celebrating their joint twenty fifth wedding anniversaries: all married on the same day, in the same chapel, by the same vicar.The scene is set then for a tale of twists and turns, moral indignation and plenty of cutting jibes all aimed at Priestley's favourite target, the conceited middle classes." "Taking on the roles of the posturing husbands, Steve Jefferies, who also pulls together a tight production as director, hits the mark as the annoyingly tedious Albert Parker pointing all his North Yorkshire brusqueness – in which everything down south is a all a bit "la de da" – at his simpering wife Annie, delicately played by Penny Prisk. Kevin Kibbey takes the role of Alderman Helliwell by the horns and portrays a self-satisfied pillar of society to perfection, while Glenda Ellis playing his wife Maria vividly depicts the muddle and hysteria that her character descends into on hearing she may not be as morally upright as she thought. Anthony Jackson in the role of Herbert Soppitt, the worm that eventually turns, is the ideal foil to Ruth James who gives a knockout performance as his unbelievably overbearing spouse Clara. As the characters come to terms with their dilemma and with it the realisation they have suddenly become single, Priestly cleverly gets them to question their relationships over the past 25 years, bringing with it plenty of opportunities for fragile egos and unfulfilled lives to be hilariously laid bare. On the periphery of all the mayhem, Phil Joyce in the role of Henry Ormondroyd almost steals the show with a pitch perfect performance as the drunken photographer, with Trish Conbeer putting in a great tongue-in-cheek turn as the "other" woman. No period comedy would be compete without the eavesdropping charwoman and Jenny Slatter, as Mrs Northrop, relishes every venomous line, while Anna-Marie Fox as Nancy the alderman's niece along with David Kinnair as the local news reporter and Andrew Mullen as the obligatory flustered vicar give flawless support. Although the script ties up the loose ends almost too quickly and predictably, the cast keep up the snappy pace to the end, nicely bringing out all the duplicity and arrogance attributed to the upper and middle classes of the period that may not be too far from the truth even today. When We Are Married is at The Poly in Falmouth on Thursday and Downderry and Kingsand Working Men's Club and Village Hall on Friday." The auditions for this year's Panto will be held at the Old School at 2.00 pm and is for the main parts. Those who don't want a speaking part can come along to the first rehearsal on Saturday 28th at 2.00 pm. There will also be a music rehearsal on Sunday 29th. It's not clear as yet who exactly will be needed to sing solos, duets etc, but Cassim will certainly have his fair share, and there is a lot of scope for some of the cast to do two parts eg villager then thief. Also Loonah and co. plus Fab Rick only appear in Act 2 so they could easily be villagers/thieves to begin with. Oh and we need a camel! Please contact Chris James (01579347462 or jam_fam@tiscali.co.uk) for further information.